I recently gave five reasons why the shutdown fight was worthwhile and my number one reason was that it’s better to be on offense than defense. It seems I’m not the only one to reach this sensible conclusion. Here’s some of what Fred Barnes wrote today for the Wall Street Journal. In the deal that ended the government shutdown, Republicans…got almost nothing they’d sought. But what has been largely overlooked is that the deal didn’t curtail, much less end, the automatic spending cuts known as the budget sequester. And undoing the sequester is what President Obama and Democrats wanted most of all. The survival of the automatic spending cuts gives Republicans the upper hand in confronting the White House and congressional Democrats on budget issues… For Republicans eager to corral federal spending—and that’s most of them—the sequester is a gift that keeps on giving. …Democrats, especially Senate Majority Leader Harry Reid, are fit to be tied as they watch cherished social programs gradually shrink. Other than the assertion that social programs are shrinking (they’re simply not growing as fast), Barnes is right. By going on offense on Obamacare, Ted Cruz and his allies put the left on defense and prevented them from successfully organizing to undo the sequester. Kudos to the Tea Party for being willing to do the right thing against uphill odds. In his column, Barnes explains that the sequester has been great news. To say the sequester has backfired for Democrats is putting it mildly. …The sequester is cuts and only cuts. As a result, Senate Minority Leader Mitch McConnell noted proudly last week when announcing the end of the shutdown that “government spending has declined for two years in a row [for] the first time in 50 years.” …Saving the sequester “has been a top priority for me and my Republican colleagues throughout the debate” about the shutdown, Mr. McConnell said. …Republicans can sit on their hands and experience the joy of trimming the size of government and, thanks to the sequester, watching Democrats gripe about it. Spot on. The sequester was a major defeat for Obama (and also a big loss to the Washington establishment). Moreover, Senator McConnell is correct about government spending actually declining for two consecutive years, which is a remarkable achievement and a sign that the Tea Party has made a difference (though I explained in my post on presidential spending performance that it’s not as impressive as it sounds because of the way TARP money is measured). So let’s hope Republicans don’t fumble away the sequester as part of some tax-hiking grand bargain that will enable bigger government. 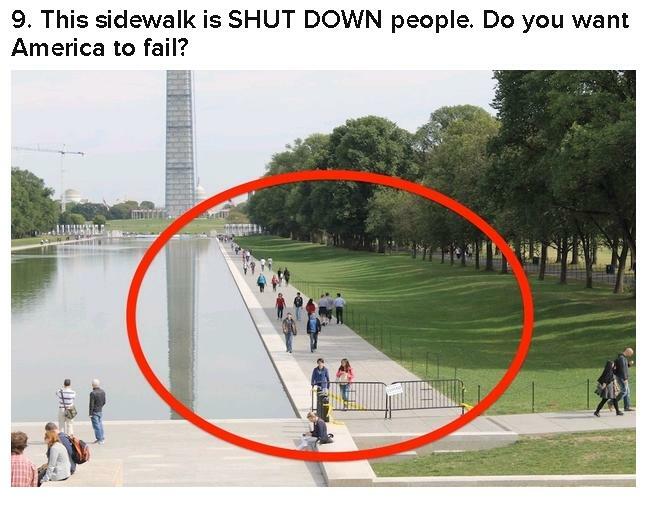 Since we’re doing some after-the-fact analysis of the shutdown fight, this gives me an opportunity to belatedly share some great shutdown images from Buzzfeed. There are about 20 of these, all of which are worth seeing. Here are my three favorite ones. We’ll start with some horrid anarchists disobeying the government. 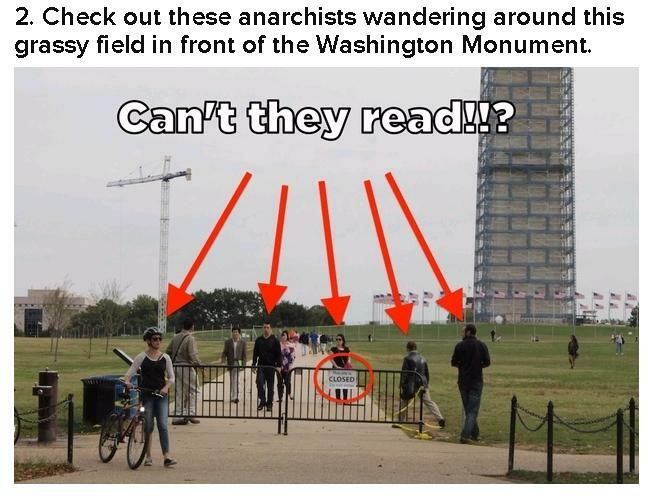 Here we have some radicals, probably from the Tea Party. 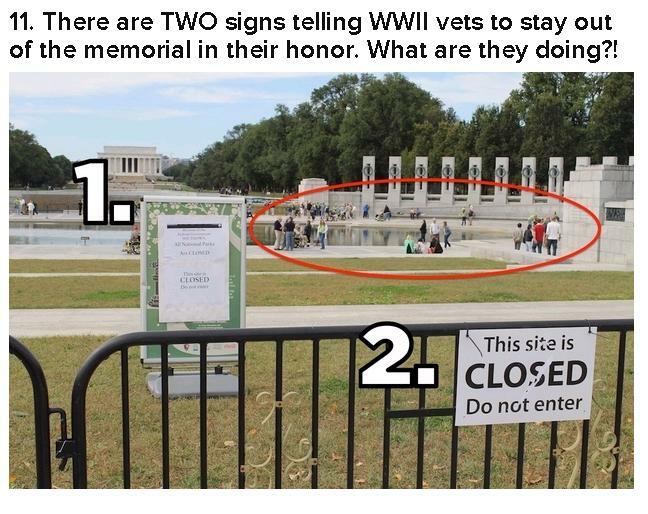 Last but not least, here are WWII vets who failed to obey the statist clowns at the National Park Service. P.S. Previous examples of government shutdown humor can be enjoyed by clicking here, here, here, here, and here. Instead, the bigger concern is that the Republicans caved in on renegotiating the discretionary spending levels set by the 2011 Budget Control Act and sequester. Everyone is hailing a “return to normal order” in Congress, but that means a return to the normal process of hiking discretionary spending every year.